I have been painting in a contemporary abstracted style since I was a student of fine art at CU in Boulder. I could not wait to get past all of my classes in realism so that I could set myself free. I knew I was a student at a school with a great art department at a point in history where I also knew instinctively that I fit in. My professors in the sixties where cutting edge and adventurous. You do not, of course, just jump right into abstraction until you have an understanding of realism and composition and all the basic principles of art and design. So I did that and it was fine but I was itchy to get past it and start taking risks in art. Through the years since then I have sometimes turned back to my own loose version of representational art and I do enjoy that, with my semi-abstracted landscapes and recently with portraits of Africans and American Indians in particular. But I consistently paint non-representational abstractions as my most fulfilling style of artistic expression. Still, after all these years it is not as if I can predict the outcome of the process even as I am doing it. The entire abstract procedure is serendipitous, improvisational, riddled with shock and surprise and the finished product is absolutely impossible to predict. And that is the charm and the excitement of it for me. The journery is the thing – listening to the paint speak to you, understanding your tools and what they will do, hearing the language of the papers in your mixed media collage, knowing how to achieve great texture and depth, knowing your canvas and being aware of the weather and the time and the mood of the day and the music that you have playing – it all factors into your art when you are feeling the abstract process in your bones and you are truly in the zone. Thus the term abstraction – you are capturing the essence of things. Ok so let me put it another way. I am usually not painting in the abstract style so that people will “see” something in my composition. Much abstract art, yours and mine and thousands of pieces of noteworthy art down through the centuries, does indeed have a suggestion of a particuler image of some particular thing, but of course much does not. One of art’s irritations for me is when I have completed an abstract image of nothing in particular and people start their wierd process of attempting to find an image in it that will “reveal” something about my motivation for painting the piece. Because that makes them more comfortable – they need a comfort zone to crawl into. They assume I have purposely hidden stuff in there to be mysterious and provoke chatter and speculation about who I “really am” and what I am “really thinking”. That makes me crazy. Many times I am standing right there next to them as they do it. They begin to “see” stuff and then they look over at me as they “explain” what they see and what they believe is so obviously my motivation for the art. What are they looking for from me? A nod and a wink, indicating they have busted me and figured out exactly what I was thinking as I painted it? Sort of like “gotcha”? Come on. As if…. Abstraction does not always have to carry the weight of a major statement that smacks you in the face or a hidden agenda that creeps up on you or even evidence of a noticeable mood swing on the part of the artist. Some of it is there to be appreciated for the simple balance, the beauty, the freedom, the energy, the force, the quiet, the sensuality, the essence, the whatever. Please don’t take one of my paintings and turn it upside down or stand on your head or rotate your eyes all around each side of it looking for a duck or a funny little man or an angel or some other stupid thing that I did not put in there. And if you purchase it, please hang it in the proper orientation in which it was painted, not the direction in which you are comfortable viewing it because you “see something” that way. It is all about respect. This entry was posted in Uncategorized and tagged absraction in art, abstraction, appreciation of abstract art, art pet peeve, artistic interpretation, essence of art, intellectual art, message in art, risk taking in art. Bookmark the permalink. Contrary to your method, I do not always hang my abstract paintings in the orientation in which they were painted. I often rotate a finished abstract painting and view it from each of the four orientations to see which strikes me as the best statement. I think a good abstract can be hung in any orientation, but usually the painting asks to be hung a certain way. Well hello Peter! I do agree with you that a good abstract can often be hung in more than one orientation, and that the art asks to be hung in a certain way. I might paint a piece from all directions, but then sign it based upon my preference, hoping the purchaser agrees with me and will honor that. What a wonderful gift to paint the way you do in any orientation. PS: Is that a brown snowboard I see in there? And the skier fell and blood is dripping down? Saw your abstract art pieces long before I saw your more ‘realistic’ creations. Love them all. 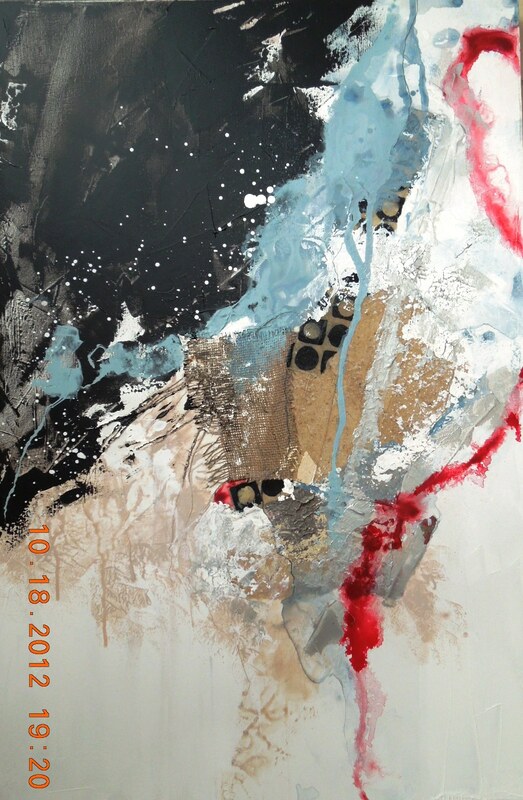 But there is something so primal about your abstracts, they speak their own powerful language. As I’ve told you, when I grow up I hope to paint more like you. Not that free…yet. Primal is an adjective I love Thanks for that comment “E” !!! !